Sure, we may be based in London, but we love having our members spread across the world, posting flats and visiting new cities. At Flat-Club, we want travel and relocation to a be a new, and exciting venture for everyone - but with the comforts & safety of home. Everyone on our team loves travelling - who doesn’t? As a company we have probably trekked thousands of miles across Europe, Asia, and the Americas. Many of us have had the chance to spend time in the beautiful capital city of Germany: Berlin. Berlin made for such a lovely visit for many of us, it wouldn’t be crazy to think about moving there - if we had the chance. If you’re thinking about moving to Berlin, we’ve got a Relocation Guide specifically for Berlin that will help you make that move! If you’ve been inspired to book your own trip to Berlin, check out all our accommodation options on Flat-Club! Or send our free Expert Search team your details and they'll match you with a great place. Here at Flat-Club we really pride ourselves on our user's experiences. After all, without our guests and our hosts, what would we do all day? We've taken note of some great ones on our Testimonials page, but we thought we'd go a bit more in-depth for a series on the blog - this entry is specifically on host experiences. We were able to have a little chat with a few of our hosts, and here's what they had to say about Flat-Club. Interested in renting out your place? We've recently made it even more simple to post a flat, so there is no better time than now. So, as you can see our hosts agree that joining a club is a worthwhile venture - both for themselves, and for their guests. Search for and find your club, and start enjoying the benefits immediately! Make International Moves Easier with these 5 Businesses! There was a time where moving overseas was quite the perilous journey: fraught with tension, heartache, and the potential for seasickness - and that was just the 90s. Nowadays, there are hundreds of services on the market that can make your relocation easier, here are just a few that we found particularly interesting. What do you think? 1) Lycamobile - Lycamobile is a cell service provider that offers extremely competitive (read: cheap) rates to many international destinations, and allows you to maintain a local number for various countries on one sim card. That way, your costs are lower when getting in touch with friends and family back home, wherever you are - and you can give people a local number to dial to get in touch with you! 2) Lovespace - Lovespace is a new service on the scene, but they’ve filled a huge gap in the market that you may not have even been aware of. Basically, you call Lovespace and request some free boxes, pack your stuff up, call Lovespace again and they come collect your boxes (for free!) and store them in their London warehouse. Then, when you’re ready, they’ll deliver your boxes back to any address for under £10 a box. Perfect for when you’re moving house and you’d like a few bits and pieces off the moving van. Or, when you’ve let your place out over the summer and you want your fragile items away from potential falls, spills, and heartache! 3) UK Work/Study Pack - The UK, specifically London, is a major hub of international relocations, being that it is one of the major cities of the world. This means a lot of businesses cater specifically to those who must relocate to the UK whether it be for work or education opportunities. Some do stand out from the rest: enter UK Work and Study Packs, a great and affordable resource that documents everything you need for Work or Study Visas, and sends you a well-organized packet to make every aspect of the transition easier. In addition to this, you’ll also have access to over-the-phone assistance from experts, about topics ranging from tax law (always a bit of a headache, otherwise), to obtaining medical cover for you and your family. Full disclosure - we’re in the pack. 4) Transferwise - Even if you plan to permanently relocate to another country, there are often loose-ends back home that will involve the transfer of money from one account to another. The traditional way of doing this is bank transfers, but these can take upwards of one week, use the lowest exchange rate possible, and often include added costs from the bank for the privilege of moving your money around. Transferwise’s fees are much more reasonable, they work just as quickly as a bank, and best of all, they use real mid-market exchange rates - it works in such a cool way, if you’re in the UK and need to send some US dollars to a person, you’ll be matched to someone who needs to send pounds to someone in the UK. Exciting, huh? 5) Pet Relocation - If you’re relocating internationally for business or for educational purposes, you may not have taken into account travelling with your pet. The unfortunate reality of the international movement of animals is that it is surprisingly expensive, and if travelling in cargo, they’re not guaranteed to be permitted on the same flight as their owners, which causes a lot of stress as you may find it difficult to ‘meet’ them after you’ve landed. Pet Relocation is a service that provides not only tons of advice and assistance to get through the necessary requirements for customs clearance (they vary from country-to-country), but also people along who will be able to meet your pet and transport them via car to wherever they need to go to meet you. Bonus... Flat-Club - Sure, maybe we’re a little bit biased, but check out our latest Relocation Guides- including London, Chicago, Barcelona and more. Our free Expert Search makes relocation a breeze, too. Just tell us where you're going, how many of you there will be, and your budget & our team will find you great accommodation. We believe that these services really do make moving across the world much easier, and we’re looking forward to bringing more cool new businesses to your attention. Let us know what made your move easier and help spread the word! Finding a flat is easier than ever! The Flat-Club blog is back once more to highlight another one of our brand-new features! We have already covered our clubs, and the post a flat process, and now we’re on to another vital part of our site: searching for a flat as a guest. The technology behind our search has been improved - so when you are looking for a flat, you will see the most relevant results for you as a guest first. For example, if you’re booking a particularly long stay, our search will show you flats that have better prices for longer bookings - and you’ll see the monthly price rather than the nightly. We tailor the results for you. There is more information at the results screen when you search. You see the host’s clubs right underneath their picture, the number of reviews for that particular flat, and the neighborhood of the property. These little details will bring you more peace of mind, right from the start of your search. Filter your search results to see the best flats for you. 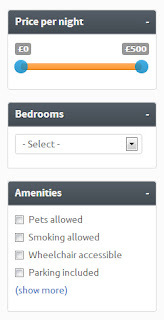 You can filter your results by type of flat, the price, or any necessary amenities that are available. For instance, if you need a 1 bedroom flat within a certain price range that can accommodate pets, you can find exactly that on the search results page. Also new on the results page is our map, with clickable pins. 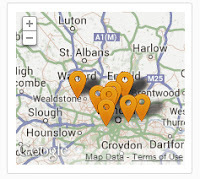 This makes it significantly easier to find the property you want in the right area. Just click on a pin and go straight to that flat. Search with flexible dates if you’re...flexible on your dates! If you’re taking a long trip, an extra one or two days on either side is likely not to be a problem, so why not search with flexible dates? You’ll be able to see more flats, and you might find something perfect for you that is just that one day off. Search has been massively improved, and we’re so happy about how it has turned out. Search now, and see what’s new!